As with most large animals, different parts of the carcass are more suitable for different cooking methods. This is due to several factors for example the amount of fat or sinew plus the amount of work the area has been put to throughout the animal's life: the parts of its body which are used frequently build up connective tissue and tend to be tougher e.g. the neck which is constantly moved about in order to the animal to graze. Unfortunately, the closure of many butchers shops has meant that people no longer know which part of the animal they are buying apart from the generic "stewing steak" or roasting joint. However, if you are lucky enough to still have a good butchers or farmers market nearby, then asking for a particular cut can lessen the chance of incorrect cooking. 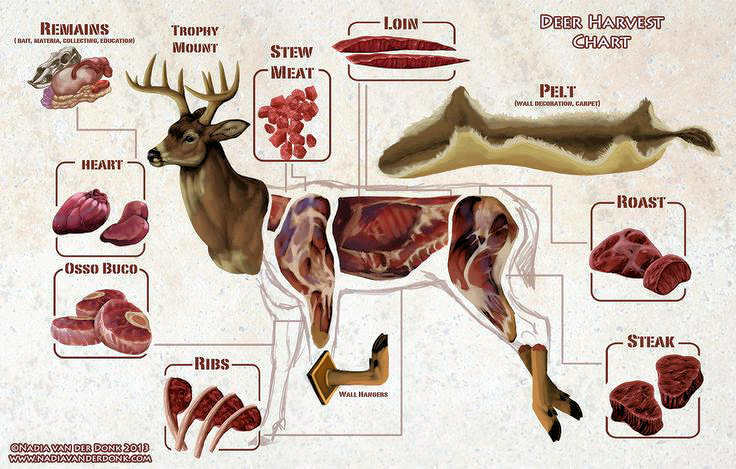 Below is a guide to the various cuts of venison plus some sample recipes. These may vary from country to country with different butchering techniques. Also, in some countries the term "venison" includes other animals such as elk, however the cuts and methods of cooking are similar enough as to be applicable to all. To find all the venison recipes on this site visit the main Poultry & Game page or use the search form. This cut is often sold as venison stewing steak and is best used cut into chunks for casseroles, stews and for braising. This is a prime cut which is one of the preferred cut for roasting. It is also sold cut into slices (collops) or steaks and pan-fried. This is another more expensive prime cut and is where fillet and medallions are cut from. The front part is called the rack and is suitable for dry heat cooking such as roasting or grilling. Racks are often "Frenched" which means that the upper ends of the rib bones are scraped clean of meat and fat thereby exposing the bones. The rear part is called the loin and is also suitable for roasting, grilling or frying. One of the cheaper cuts, meat from the shank area is only suitable for long slow, preferably moist cooking. Usually sold in chunks. Often sold boned and rolled the shoulder can be stuffed and braised. This cut is also sold diced for stewing, casseroles or in soups but the better joints can also be roasted.